NEW YORK -- Here are a few phrases an NBA team doesn't want to hear when there's less than a month before the start of the playoffs: soft tissue damage, cyst removal, Dr. James Andrews. The Houston Rockets were in the midst of a hard charge during the second half of the season, racking up victories in 28 of 35 games since Jan. 1 as they zoomed in position to get home court in a playoff series for the first time since 2008. 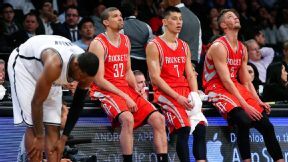 AP Photo/John Minchillo The Rockets struggled without Dwight Howard and Patrick Beverley. Will they lose their hold on playoff home court? Then last week, a reminder about the league's fragility was served as Dwight Howard had a setback in recovery from an ankle issue and what looked like a relatively innocuous knee bump resulted in a torn meniscus for Patrick Beverley. Now, instead of a push toward the No. 3 seed and continued rhythm into the postseason, the Rockets find themselves grinding their teeth and trying to hang on with the hope they can resemble their true team in time for the grinder that is expected to be the Western Conference playoffs. With the added issue of the flu for forward Terrence Jones, the Rockets had just nine players in uniform Tuesday night and three starters on the sidelines. The result was predictable in Brooklyn, where the Nets have been the Eastern Conference's version of the Rockets since Jan. 1 and totally unbeatable on their floor. With Howard in a suit, Beverley back in Houston going through hopeful rehab and Jones looking peaked after flying in during the day, the Nets ripped the Rockets 105-96 to take their franchise-record 14th straight home game. The Nets are now 30-12 since Jan. 1 and have clinched a playoff spot, something that looked less than assured when they started the season 10-21. The Rockets are now 0-2 since Beverley went down and Howard, who has had his left ankle drained twice and had a cyst removed from it two weeks ago, had to shut it down. It isn't clear when either will be back, though there's a nebulous hope around the team that it will be before the end of the regular season. Andrews pronounced Beverley not in need of surgery and said he's experiencing little pain and no swelling, creating the belief that he could be back in two weeks or so. Howard went through some light drills before the game and pronounced he wasn't worried at all, though he will miss Wednesday's game in Toronto for sure too and probably more time after that. Without their best interior defender in Howard and their best perimeter defender in Beverley, the Rockets' defense has predictably cratered. They gave up 118 points to the Los Angeles Clippers on Sunday and the Nets put up 53 percent shooting on them. Joe Johnson repeatedly worked over James Harden at the defensive end Tuesday, putting up 32 points in just 34 minutes. "We had the same [injury] problem earlier in the season and we thought we'd gotten over it," Harden said. "We got healthy, got into a groove, got some mojo and then we have three starters out. We have to figure out a way to play through it." The Rockets have some wiggle room, thanks to their excellent play over the previous three months. Their lead on the Portland Trail Blazers for the No. 4 seed is three in the loss column. The Rockets have five road games left and home games against the Oklahoma City Thunder and the San Antonio Spurs without assurance of when Howard and Beverley may be able to play. The Blazers, who have been struggling themselves recently and are as close to eighth place as they are to fourth, have just one road game left. Regardless of all that, the Rockets are going to have issues against any opponent in the postseason if they don't have Beverley to handle the fleet of strong point guards that resides in the West. They also really need the Howard of February, who averaged 23 points and 13 rebounds that month before the ankle issues started slowing him down, if they hope to make the type of run that appeared to be in the future when they recently ran off 15 wins in 17 games. Naturally, the team feels it can return to that form but frankly, they just don't know what they'll have. Meniscus injuries are infamously inconsistent. Howard has already made the mistake of coming back too quickly from the ankle issue, making it likely the team will try to be conservative. Without Howard and Beverley, simply put, the Rockets don't have as potent of a team. Tuesday their lack of depth, especially at the big men spots, and their unfamiliar lineups left them trailing almost the whole game. Without their inside options, they ended up hoisting up 35 3-pointers, of which they made just 10. Coach Kevin McHale complained about his team not playing together. "I don't know how you have to know somebody to throw the ball to the open man," McHale said. "What, do you have to know him personally?" Such is the coach's prerogative, not to allow excuses to mentally defeat his team. But watching the Rockets struggle in the halfcourt, it was hard to argue that they're just in the midst of an uncomfortable period while they wait for good news from the trainers and the doctors. "It's tough to figure out what we need to correct because there's so much inconsistency in the unit," Harden said. There were some bright spots. Backup center Omer Asik, who has brooded much of the season because he's unhappy about his demotion since Howard signed as a free agent, had a career-high 23 rebounds now the reins have been taken off. Harden nearly set a team record by going 16-of-16 at the foul line. But then you realize that, other than Asik the Rockets got just 21 rebounds as a team. And other than Harden, they were just 6-of-12 at the foul line as they mostly abandoned basket attacks. Considering how many points Harden gave up to Johnson, his own 26 points were a wash. Harden went scoreless in the fourth quarter when it looked like he was low on energy. All hallmarks of a team that doesn't have enough right now to compete at the level the Nets have been playing at. "We are who we are and have who we have," said Rockets forward Chandler Parsons, who scored 16 points. "Our biggest thing right now is to get healthy." MVP: LaMarcus Aldridge and Damian Lillard both had stellar performances. Aldridge scored 31 points on 20 shots, collecting 15 boards and dishing out six assists. Lillard added 34 points and eight dimes, including a wicked slam on Chris Kaman in the second quarter. X factor: Nicolas Batum quietly had an all-around strong game, shooting 4-for-5 from long range en route to 16 points. He also grabbed five rebounds, had seven assists and came away with a couple of steals. It was a pivotal performance overshadowed by Lillard and Aldridge lighting it up. Defining moment: The fourth quarter completely belonged to Portland, which put the game out of reach early in the period behind Aldridge and Lillard going off. Nick Young cooled off, and the Lakers failed to keep up. MVP: Though numerous players made strong contributions to the Warrior effort, it was the 27-point, five-rebound, five-assist performance from Klay Thompson that made the difference. His early drives to the rim set up his fantastic 3s late in regulation and overtime. X factor: In a game with hot shooting, few turnovers and lots of offensive rebounds, the battle of points in the paint made a clear difference in the final margin, as Golden State scored 62 inside the lane against the Mavericks. Defining moment: After a possible goaltend from Jermaine O'Neal, Steph Curry hit his second game-winner over the Mavericks this season, shaking Jose Calderon to drain the shot as time expired. MVP: Joe Johnson scored from everywhere tonight. He backed down James Harden in the post (no easy task), hit four of Brooklyn's six 3-pointers, and finished with 32 points on 21 shots. LVP: With Terrence Jones out with the flu and Dwight Howard injured, Houston needed a huge game from its only two big men in Omer Asik and Donatas Motiejunas. Asik was terrific, but Motiejunas had massive foul trouble and only played 7 ineffective minutes. That was ... rough: With both teams having numerous injuries, the game at times seemed to devolve into a track meet or a competition to see who could bobble more easy shots. Houston really struggled without a useful offensive big. Stephen Curry, Warriors: Welcome to another episode of "Saved By The Steph." 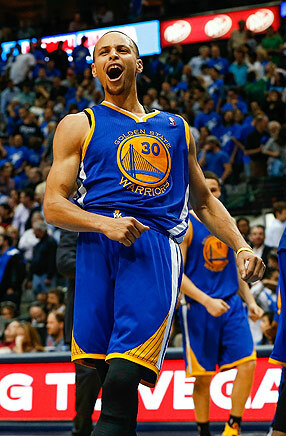 The Warriors' guard sank the game-winner, lifting the Warriors to a 122-120 win in Dallas. Curry now has four go-ahead field goals in the final 24 seconds of the fourth quarter and overtime this season, tied with Damian Lillard for the most in the league. Donatas Motiejunas, Rockets: With Dwight Howard out of action because of a sore left ankle, the 7-foot Motiejunas did not help fill the void, going scoreless while committing four fouls in eight minutes in the 105-96 loss to the Nets. "I don't know how [long] you have to play with somebody to throw the ball to the open man. What, you've got to know him personally?" -- Rockets coach Kevin McHale, on his team's ball-movement issues in a loss to Brooklyn. Kevin Jairaj/USA TODAY Sports Warriors guard Stephen Curry reacts after hitting the game-winning shot in overtime that sank the Mavericks. The Nets clinched a playoff spot with a win over the Rockets. Brooklyn entered January 1 with a 10-21 record. The 1985-86 Sacramento Kings were the last team to make the postseason after entering January 1 at 10 or more games below .500.